(l-r): Kristin Binford, Integrated Marketing Manager; Chris Langston, Co-Founder; Tim Tuttle, Executive Director; Kim Laws, Business Development Director; Luke Hurd, Technical Director; Josh Burch, Co-Founder; Kelly Thompson, Project Management Director; Megan Hopkins, Associate Experience Director. Let’s see how well you know the history of fast-growth companies in the Kansas City region. Thirty-one years ago, this magazine rolled out a feature called the Corporate Report 100 (Which made sense, as feature titles go, since this publication was then known as Corporate Report Kansas City). So who was No. 1 that first year? Bonus points if you said Sprint Corp. Back then, it was a comparative upstart in the telecom sector, with $267 million in revenues for 1985, a rounding error compared with today’s $34 billion. But only once more since that debut would Sprint be able to crack the CR 100—and in the No. 100 slot, at that—before the revenue base became too big to generate sustainable high-percentage growth, especially in telecom. Coincidentally enough, the second year of the CR 100 introduced a new name to the high-growth roster: In 1987, Cerner Corp. debuted here with slightly less than $18 million in revenues. In nearly three decades since then, Cerner has dethroned Sprint as the largest private-sector employer in the region, based on the number of employees. But there are profound differences between these two pillars of Kansas City commerce and industry. Unlike Sprint’s two-and-done experience, Cerner is back this year for a record-breaking 22nd appearance on Ingram’s CR 100 ranking, with 2015 revenues of better than $4.4 billion. And it’s not done growing—the healthcare IT company’s local work force of nearly 12,000 is expected to more than double by 2025, when construction is scheduled to wrap up on its Three Trails Campus in south Kansas City. Those companies are two of KC’s titans of business, with growth reflected and success measured in different ways on their paths to gargantuan size. A decade ago, economic-development minds wondered which companies might be the next Sprint. Today, with the question answered, they ponder who might supplant Cerner as the region’s largest company. Perhaps that mystery will be resolved from among the companies who claim their position in our 31st annual Corporate Report 100, but it will take some doing. Cerner, after all, continues to distance itself from the pack. And more than 500 companies once recognized at least once for fast growth failed to earn those honors a second time. The good news with the 2016 installment of the CR 100 is that growth seems to be expanding. For the first time since before the Great Recession set in, growth for No. 100 has topped 65 percent growth in four years, having plunged from 75 percent in 2008 to 20 percent in 2009 and only incrementally creeping back in years since. Regrettably, Keller-Williams Northland, a residential realty firm, missed the final list this year, in fact possibly the Top 10, even though it could have produced an impressive finish had the numbers arrived before our production deadline. That’s just one more demonstration of how difficult it can be to claim your position on Ingram’s CR 100 ranking. And once there, it’s even harder to keep your place in line. So whose hot streak in 2016 will change the look at the top of our All-Time Honor Roll? Guess we’ll know the answer to that in another 30 years. See you in 2046. (l-r) Kristin Binford, Integrated Marketing Manager; Chris Langston, Co-Founder; Tim Tuttle, Executive Director; Kim Laws, Business Development Director; Luke Hurd, Technical Director; Josh Burch, Co-Founder; Kelly Thompson, Project Management Director; Megan Hopkins, Associate Experience Director. 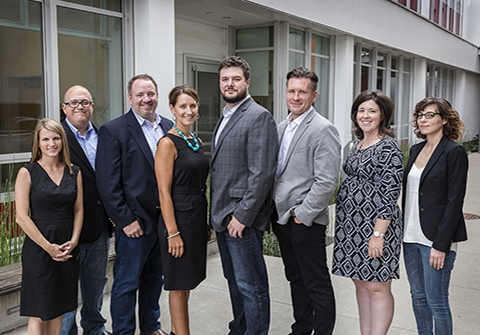 It started as a Web development company in Springfield in 2003, but after expanding into the Kansas City market, moving here and rebranding in 2008, 40Digits is firing on all cylinders as a digital agency specializing in strategic software design and development. But to get the company where it is today, founders Josh Burch and Chris Langston had to rely not just on their entrepreneurial zeal, but their ability to navigate in unfamiliar waters: Both came to the world of digital marketing with the perspective of business executives, not marketers. Not, however, without a few bumps in the early going. But that’s where the ability to pivot quickly would pay off. One of the things they were good at was sounding out guidance from the right people. After expanding to Kansas City, where there were more potential client firms, the search for new office space led to a meeting with a Barkley executive. Not long after, the two organizations were collaborating on various projects, and in 2014, 40Digits joined the Barkley family of companies. and design and development initiatives. Among its success stories: creating the Web site for the SunnyD juice-drink product line, and working with clients like Lee Jeans, Wingstop and Dairy Queen, and helping the non-profit Convoy of Hope create a new, more effective Web presence. Hector Dean (left), Michael Dean. 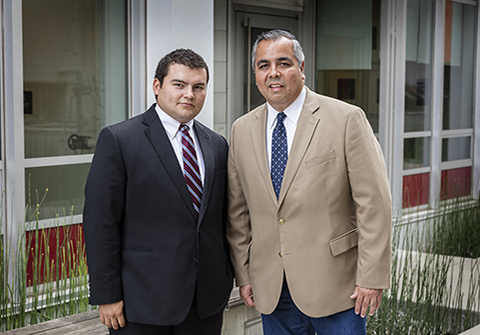 The odds for success were never in the Deans’ favor—not for Hector, who would assume day-to-day operational oversight when Agua Fina launched in 2012, or for his father, Michael, who would be there to provide guidance and backing from a career in the construction sector. But factors like a tight-knit construction community, bank reluctance to lend to a young owner and minority status would yield to a raw determination within this commercial and residential landscape, irrigation and site-work contractor. (l-r) Dave Coughlin, Director of Operations; Steve Beyer, Vice President-Engineering Services; Jeff Oesterle, Engineering Manager; Mark Dohnalek, President/CEO and Owner; Tom Tougas, Global Engineering Director. tems, medical devices—the product portfolio is a tinkerer’s para-dise. “We’re a company that has to find clients like needles in a haystack,” Dohnalek said, and digital marketing helped shrink the size of that task. Social media and effective search-engine optimization were keys to drawing prospects out of that haystack. (l-r, rear) Kelli Foster, Operations Manager; Brianna Blan, Store Development; Tabatha Koehn, Customer Service Representative; Rosanna Spencer, CSR; Michelle Coffey,; Susan Harper, Human Resources; Karla Breuer, CSR; Scott Harper, Owner; Corey Holland, Store Development; Debbie Kite, CSR; Delora Fritts, Accounting. (Front); Christina Jenkins, Customer Service Lead; Billy Baker, Brand Ambassador. Scott Harper spent the better part of a decade as an aviation mechanic for Bombardier Learjet in Wichita. But when opportunity started bruising its knuckles on Harper’s door, he answered by starting this company in Drexel. “I always wanted to be self-employed, and I was always interested in motorsports,” Harper says. So he started a bike shop, and after a few years realized his customers were buying a lot of parts on-line. He decided that was the space to be in, as well. Today, the company is an online retailer of aftermarket parts and accessories for those off-road vehicles you might also know as a utility task vehicles, or UTVs. Along the path to growth, he developed a laser focus on the side-by-sides and UTVs and refined his marketing strategy to drive growth, constantly increasing the type and range of products offered, hiring and keeping what he says is a great staff focused on customer needs, staying up with or ahead on technology, and maximizing every opportunity presented—among other attributes. 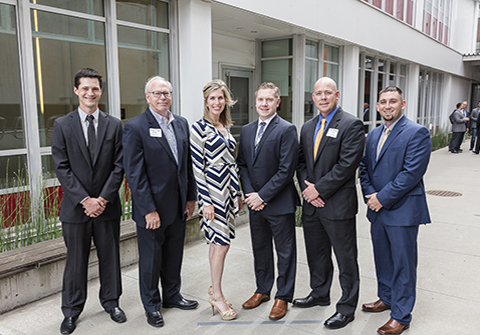 (l-r): Kody Parton, Director of Service Delivery; Dennis Fisher, VP of Business Development; Krista Sandt, Director of Sales; Brad Sandt, President/CEO; Mick Fenley, COO; David Davisson, Director of Infrastructure Services. 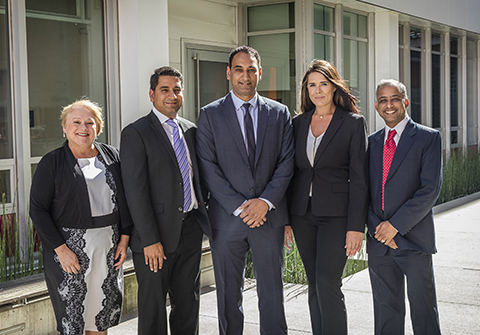 (l-r): Karen Arora, HR Analyst; Arvinder Singh, President; Gurinder Singh, Vice President; Nel Winfrey, Business Development Manager; Vipan Arora, Vice President. (l-r) Sri N. Bhuvana, Lead Technical Recruiter; Hina N., Technical Recruiter; Pankaj N., Technical Recruiter; Kiran Chelluri, President and Founder; Charu N., Technical Recruiter. Not pictured: Saipranathi Ivaturi, Founder and Chief Business Officer; Naga Sri, Lead Technical Recruiter; Judy Paulsen, Office Manager. Kiran Chelluri had a degree in computer science from UMKC, a basement, and the work ethic he grew up with in a highly competitive society like India’s. And those elements were enough. Sensing an opportunity to provide creative IT solutions for business clients in both his adopted country and back in India, Chelluri founded Chelsoft Solutions in 2010. “I always wanted to touch people’s lives,” he said, and business ownership seemed an ideal medium for that. The key to success, he said, wasn’t in the technical competences needed to serve customer needs; rather, it could be distilled to a single word: “Passion.” Learning the business without much help was the initial hurdle, but putting the right team together took the start-up to the next level. Despite the tight labor market for IT professionals, Chelluri says he’s still finding qualified people here, as in India, to drive the company forward. And despite the challenge of building on triple-digit growth, he has a clearly defined goal: “I want to be No. 1 next year!” he said, but even if not, he thinks he may have realistic shot at that by 2018. 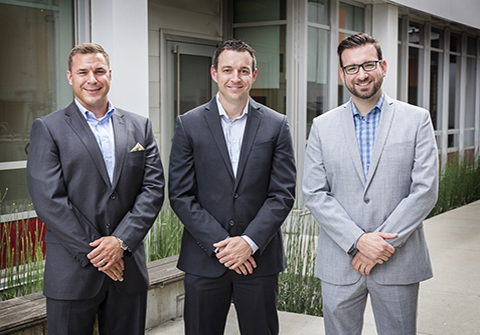 (l-r) Brandon Reed, National Manager; Josh Browne, Chief Financial Officer; Matt Conner, National Manager. It’s the first CR 100 appearance for Safe Haven Security Services, but like a lot of overnight successes, this one was years in the making. Since incorporating in 2002, the company has grown to become the second-largest authorized dealer in the country for ADT Security. In 2010, the company installed 3,164 security systems, then hit paydirt with efforts to expand into markets nationwide, and today, it operates in metropolitan areas nationwide. The key was identifying a target market in residential sales, finding a pattern that works and duplicating it over and over. Installations doubled by 2012, and exploded from there, from 6,200 to more than 30,000 through 2015. And there’s more growth coming, said Josh Browne, chief financial officer. At the mid-point of 2016, the company is on track for more than 40,000 installations this year, thanks in part to an explosion in home automation and smart-home technologies that are keeping the company’s services in demand. (l-r) Caleb Gardner, Senior Project Manager; Chad Spoor, Director of Marketing and Finance; Clint Spoor, Owner; Chris Spoor, Operations Manager; Michael Doran, Director of Design Build. Last year was the coming-out party for Complete Construction Services. Clint Spoor’s commercial contracting company followed that up with what you might call a year of foundation-setting, building a stronger organization base for what’s yet to come. “The groundwork we laid last year was establishing better processes through everything—accounting, our work in the field—then we also went out and hired key personnel, brought in some college graduates to strengthen our ability to perform better jobs, and increase our quality and our productivity. We’ve really focused on our processes.” The company also deepened its bench by bringing on Mike Doran as director of design-build, and Caleb Gardner as a project manager, supplementing the management team of Spoor and his sons, Chad and Chris. Attention to organizational detail has helped ensure that the pipeline remains both full and manageable: “We can see in the future a little bit now, as far as workload,” Clint Spoor says, addressing prospects for continued growth. (l-r) Kyle Woltman, Director of Operations; Stephanie Dodd, Office Manager; Tom D. Erickson- Executive Vice President; Amanda Erickson, Cost Accountant; Lisa Bowman, Director of Estimating; Jim Wentworth, Director of Service Maintenance. Not pictured: Lisa Erickson, President. When you hear the phrase “an industry that’s been slow to adapt,” you know someone is poised for rapid growth. Tom Erickson saw it in the construction sector, and found a way to apply emerging technology to construction-management projects for clients around the world, including Fortune 500 companies. Blue Springs-based Metro Construction Management has been able to shave 15-20 percent off the time of a project’s completion, with no additional cost, positioning the company for success and a growing client base. “Every day that a store or facility isn’t open on time translates to lost revenue and return on investment,” Erickson said, creating a demand for the company’s services. Two years ago, it started a facilities-maintenance division, handling preventive maintenance and repairs for its clients. And there’s more growth to come; a major client is set to triple its construction by 2019, and with construction costs increasing, “the demand for our solution in the current environment is even more critical,” Erickson says. Supplying high-quality chocolate to producers, Foodlinks again flirts with a Top 10 finish—it was No. 1 in 2014. The company imports and distributes Colombian single-origin chocolate and non-GMO sweeteners and coatings as ingredients,selling and distributing couverture (used in chocolate coating/covering), chocolate chips and chunks to manufacturers and retailers. After an impressive debut performance last year with a Top 10 finish, family-owned Worcester Investments makes another strong push. The company has been aggressively purchasing multifamily property in the Kansas City metro area—it now owns and manages more than 3,200 units—and has used its property-management services to drive additional growth. It’s no surprise that CEO Mike Wrenn and his team at Affinity Group Management are back on the CR 100 for an impressive 10th year. What’s surprising is that the company’s high-growth mode has it approaching Top 10 status yet again. The company provides risk management, asset protection and administrative support for multifamily housing investors across the nation. Darn few companies get to be 146 years old, and fewer still among them are family-owned. But Rau Construction has been riding the rebound in the contracting sector in recent years, driven by its ability to perform in multiple settings—commercial work, health-care and education jobs, churches, office, light industrial and multi-family, among others. On the strength of record revenues in 2015, FireMon, based in Overland Park, offers solutions that provide continuous visibility into and control over clients’ network security infrastructure, policies, and risk. FireMon serves corporate clients, government agencies, and managed-services providers. Further proof that print has a lot of breathing room left if the content is relevant, Lifestyle Publications launched in 2009, providing community-inspired content for residents of Leawood. Things took off for partners Steven Schowengerdt and Matthew Perry after they started licensing the rights to the content model, and now 35 publications nationwide are driving growth. Startups and evolving brands turn to Crema to create their on-line presence, and the word is out on this Crossroads-based digital marketing firm. Founder George Brooks and his team have broken through to CR 100 status with the help of product designers, developers, and business strategists who provide Web and mobile development, UI Design, and product strategy. Mike Hagen Electric has been in business for more than 35 years and makes its debut appearance in the CR 100. Fully licensed and bonded, it works with new construction and existing buildings in both commercial and residential settings. More recently, growth has come after diversifying into overhead street lighting, parking lot lighting, and new lines of service and maintenance. “High-quality associates making money for clients by optimizing opportunistic investments.” That says Ben Kalny, who co-founded this Kansas City, Kan., firm with John Emanuels, has been a recipe for growth. That means buying income-producing real estate that meets the highest levels for measuring quality. The firm also acquires discounted loans liquidated by distressed financial institutions. A former CR 100 No. 1, Pendo Management Group is a nationwide real-estate appraisal management company. Since its inception in 2009, the company has relied on a state-of-the-art technology platform, highly trained and certified appraisers, superior customer service and process control and improved efficiency to drive its growth. If you need a document produced, or deduced, from Farsi, Tohono O’odham, or Haitian Creole, you can get it from Propio Language Services. The company, founded in 1998 by Joseph Fackrell, offers translation services in more than 200 languages—over the phone or in person—for 2,000 clients in 46 states. Leawood-based Solomon Consulting Group says its goal is “to make our clients’ information technology departments better with solutions in staffing, reporting, analytics, and software development.” Most recently, that has meant helping them focus on business intelligence to drive growth, as have partnerships with industry leaders like Microsoft and Tableau. Mary McNamara plowed every cent she had—and a lot of them she had to borrow—to acquire an 80-year-old company back in 2008. But it wasn’t a gamble: She was betting on herself, and a working lifetime’s understanding of the commercial roofing business. Eight years later, Cornell is humming along nicely, with revenues that have nearly tripled since 2012. The formula has worked for 65 years at this Lenexa-based general contracting company: Work hard, push the schedule and hire loyal, dedicated people who can build a project that meets the customers’ needs. Riding the regional boom in multi-family construction, the family business has recovered impressively from the 2010 construction-sector free fall. Taking advantage of the bustling logistics and distribution sector in this region, D&L Transport has carved out one successful niche after another, providing brokerage services for truckload, less-than-truckload, heavy freight, rail shipments—even trade-show logistics. The company contracts with other carriers to ship products across the nation and into Canada and Mexico. Jakobe Furniture is a custom manufacturer of upholstered and wood seating, including booths, sofas and chairs, as well as tables and cabinets for the contract and hospitality industries. But it also can fashion those elements using steel, tile and glass. Repeat and referral customers have driven its most recent growth, and it relies on word-of-mouth to bring in new customers. Relocating its headquarters and operations from Cedar Rapids, Iowa, to Lenexa proved to be the right call for Sainstore, on-line interactive agency primarily oriented towards clients in manufacturing. The company offers market research and analysis, experience design, Web development, e-commerce distribution, digital advertising and social influence marketing. Overland Park-based United States Appraisals provides professional appraisal-management services in all 50 states. Customized personal service, a cutting-edge on-line tracking system that manages every appraisal order from start to finish, and the ability to deliver confidence to the valuation process have been a winning formula, says President Aaron Fowler. New products and services—not to mention a new name—have been the keys to growth at SquadBuilders, a health-care staffing firm. Formerly known as Professional Nursing Services of Kansas, the company was founded in 1990, then rebranded in 2015 and opened two new divisions, specializing in travel nursing and technology, says General Manager Ryan Vaughan. Herzog Contracting is at the forefront of rail and highway construction nationwide. Closer to home, the company played a key role in development of the Kansas City streetcar system that debuted this spring. It builds new track lines and performs bridge construction and earthwork, and its highway construction unit handles grading, excavation and demolition work. The American Dream takes on a new meaning in the hands of the craftsmen at Lambie Custom Homes, because founder Jim Lambie’s Overland Park company specializes in creating dream homes. The company has been at the forefront of the rebound in residential construction with an array of floor plans in nearly a score of in-demand residential communities. There’s something to be said for successful advertising the old-fashioned way: “Our company primarily grew by word of mouth from our base of clients,” CEO Marko Ungashick says. Two West Advisors is a fee-based registered investment advisory firm specializing in retirement plan services, with a niche expertise in the 403(b) market, and has $752 million in assets under management. Pulling together the key pieces of engineering, architecture, construction and consulting—much of it in the life-sciences, bio-tech, pharmaceutical, food and research-facility sectors—CRB works on projects around the world. In the past three years alone, its employees have been engaged in work in 22 nations, from Argentina to Venezuela. Jeff Biskup is the CEO. New floor plans and reinvigorated marketing efforts have taken SAB Construction, a 27-year-old home builder, to new heights since the residential construction downturn started to ease in 2012. By not limiting itself to single-family homes, the company has also benefitted from the regional boom in multifamily construction. Co-founded by Brad Carlson (now the CEO) while he was still in college, MAG Trucks specializes in refitting step vans used by delivery companies, food-truck operations, linen-service companies and others, and sells both new and used versions of them. It also offers commercial truck and equipment financing and vehicle relocation and delivery nationwide. Building houses that combine elegance and functionality, Summit Custom Homes continued its growth streak by adding technology that engages potential customers, by upgrading its CRM system to improve relationships with clients and prospects and by rolling out its new Lifestyle suite of home designs, says CEO Fred Delibero. While much of the U.S. banking sector was contracting and consolidating, CrossFirst Holdings (d.b.a. CrossFirst Bank) has been charging into the fray and succeeding in ways no other regional bank. In less than a decade, and in a bank-heavy market with more than 100 institutions when it started, it has grown into one of the region’s Top 10 among local banks, measured by assets. Based in Overland Park, Avenue Link is a performance-based on-line marketing company that specializes in targeted on-line and mobile lead generation, plus data-monetization services. Among its strategies are e-mail and affiliate marketing, search engine pay-per-click advertising, and data management. Debbie Hoschouer, accounting and finance manager, understates things just a tad when she assesses the growth at this Lenexa-based custom home builder. “The economy got better,” she says, but also notes that “we have developed better home plans and our service and marketing is impeccable.” The company builds new homes across Johnson County in the mid- and upper price levels. This user-experience consulting firm designs and refines technology products to make them easier for people to use, particularly focusing on complex business products and tools for financial services, health care, distance learning and insurance. Good, old-fashioned market demand, says development manager Lisa Nolke, drove growth from 2012 to 2015. 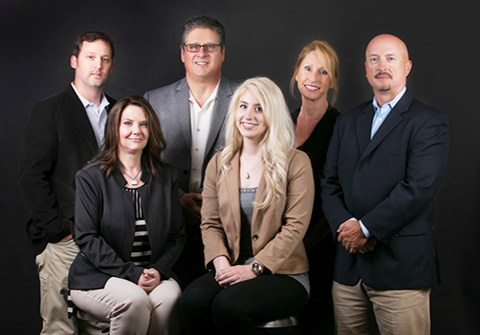 The clientele at Frontier Wealth Management includes individuals, families and business owners who can tap into a full range of advisory services, including financial and tax planning, risk management and insurance, investment advice and other guidance. The company creates individualized, customized plans for clients with varied needs, means and goals. Few companies manage growth as consistently well as this civil engineering and surveying firm, which has earned an impressive 12 Corporate Report 100 placements in the 24 years since its founding. One key to that has been the firm’s ability to work in varying sectors like education, health care, commercial, office and retail, mixed use and industrial, among others. This Kansas City company is a full-service plumbing contractor focusing on commercial work. Among its higher-profile projects for owner Doug Brown and his crew, recently in the works or coming up, are the renovation of Spencer Theatre for the Kansas City Repertory Theatre and the innovation-campus transformation of the former Westport High School building. United Country Real Estate Group serves conventional and auction real-estate professionals nationwide, offering a comprehensive marketing program for sales and purchases of lifestyle and country properties. Angela Smith, public relations and social media manager, said growth through 2015 came by adding more professionals to the network and more franchises nationwide. Closing in on its golden anniversary, Mission-based Walz Tetrick is a full-service advertising agency that prides itself on bringing an entrepreneur’s mentality to the needs of its clients. The goal, always, is to help get people talking about clients’ brands. No better example of that came than the “Salvy Splash” billboard that graced Southwest Trafficway after the Royals 2015 World Series. This 20-year-old company, now headquartered in Martin City, is a tale of two firms: In the Kansas City market, it’s known primarily as an electrical contractor, but for a broader geographic market, it operates as a general contractor, as well. It has worked on iconic structures like Kauffman Stadium, Arrowhead Stadium and Children’s Mercy Park. It also has offices at Whiteman Air Force Base and Bossier City, La. Specialists in architecture and interior design, Hollis + Miller Architects attributes its performance through 2015 to organic growth and new client partnerships. The Overland Park company, led by John Southard and Kirk Horner, bills itself as the longest-practicing architecture firm (since its founding in 1950) in the Kansas City region. 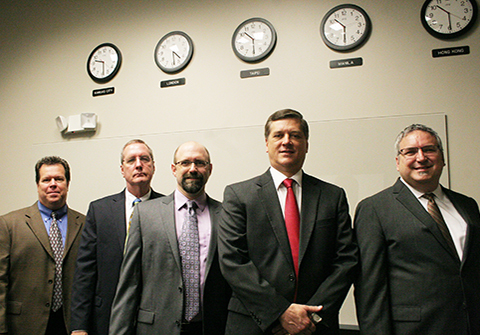 This security company specializes in crime prevention and detection for hundreds of companies. A key word there is “prevention,” and every one of the more than 250 Titan officers has law enforcement experience or has been trained by a law-enforcement professional. With on-site and patrol coverage, Titan also offers security consulting and 24/7 remote video monitoring. Innovation has found a way to link dirt and data, driving improved efficiencies on the farm, and this company based in the Cass County hamlet of Archie is leading that effort. Those applications apply to every point on the spectrum of farm operations, from seed selection to grain storage and commodity marketing. This Lenexa company owns and operates restaurants in Kansas City and, further north, from Omaha to Ottumwa, Iowa. They operate under banners like Tonic, Saints Pub + Patio, Beaver Tap and Taco Hangover. Acquisitions helped drive growth through 2015, but the company also prospers by providing management services to various other sports pubs and bars. Chief of Staff KC was founded by Jessica Underwood in 2011. Already, it serves more than 90 area companies with temporary staffing and full-time placements, with a particular focus on placing workers in office roles. The company credits quality relationships for its retention rate of greater than 90 percent, and she says a bigger internal recruitment team helped drive growth. Established in 1995, ECCO Select is a technology consulting and IT staffing-services company serving a diverse client base of public-sector agencies and private commercial firms. It attributes its recent growth to clients’ recognition of excellence and quality in software development, systems integration, rapid resource deployment, security and program management practices. When it joined an exclusive roster of public companies from the Kansas City area last year, Tallgrass Energy was credited with being the largest initial public offering in the nation. It comprises a family of companies formed to own, operate, acquire and develop midstream energy assets in North America, particularly with natural gas, providing transportation and storage services. This company specializes in creating signature events, meetings, incentives, gift campaigns and event marketing. Among its growth factors were new strategic marketing efforts, new client acquisition, additional services delivered to existing clients, expansion into new markets and effective use of new technologies. A multi-faced general contractor based in the Crossroads district, Centric Projects confidently jumped into the gaping maw of the nation’s construction sector downturn in 2010, and immediately made an impact. It offers construction services in office buildings, health-care and institutional buildings, single-family and multi-family residential construction and retail structures. Apple Bus is a full-service passenger transportation firm, with 95 percent of its business coming from student transportation, para-transit and shuttle bus services. A decade after the Cleveland, Mo., company was founded, the leadership moved to expand geographically outside of the Midwest. Result? Strong growth and a first-ever appearance on Ingram’s CR 100. A full-service architectural and preservation consulting company, Strata was founded in 1997 and, as a woman-owned company, has found success in the design sector. Though one of the smaller companies on the CR 100 this year—the addition of staff to bring the head count up to six was a key factor in the firm’s ability to take on larger federal projects. One of Kansas City’s newest public companies—the initial public stock offering came earlier this year— Bats is a former CR100 No. 1 that has revolutionized equities trading. With operatons in both the U.S. and Europe, its ability to handle high-speed, high-volume transactions has made trading more efficient, and made Bats one of the world’s biggest trading platforms. When the urge to vent at city traffic engineers overcomes you at those unduly long red lights, think instead about what might be if the world saw traffic flow the way Reggie Chandra’s team does at Rhythm. The company designs, builds and installs digital add-ons that help signals improve traffic flow, cut down on red-light emissions and even make travel safer. The Kansas City region’s most recent addition to the $100 million top-line club is Intouch Solutions, founded in 1999 by Faruk Capan to capitalize on opportunities for digital marketing in the pharmaceutical sector. And he’s owned that space since, connecting customers with pharma brands, yielding rapid growth that has made Intouch one of the biggest hiring engines in the region. Truss is the identity assumed after the 2014 merger of Cretcher-Heartland and the Power Group, both based in Overland Park. The firm provides clients with risk-management tools and financial services like wealth management and retirement planning, human-capital guidance and talent development, employee-benefits planning and more. No stranger to fast growth, this Leawood-based architectural firm works in a mix of venues, from corporate and industrial to entertainment, science and technology settings, and public spaces. It also offers a range of interior design services, plus site selection, land-use and zoning analysis, as well as project management and construction consulting. Things have been looking up for this community bank ever since it rebranded from the First State Bank of Goff and moved its headquarters to Johnson County. And why not? The population in the 66210 ZIP code is twice that of the former bank’s home in Nemaha County, where the burg of Gof itself has just 126 residents. Mark Emley is the president and CEO. Next year marks the centennial for this Kansas City contractor, which took on new leadership last year with a team of five partners, including a fourth-generation member of the Anderson family. The company specializes in commercial construction, and has worked on schools, Class-A office space, public buildings and retail structures. Yes, there is a market out there for health-care carts, bins and organizers, and TrippNT is doing quite nicely in that space, serving clients not just in the U.S., but internationally. It cranks those out using various manufacturing modes, including thermoforming, computer numerical control, laser, large-format UV printing, and plastic welding. As the service lines have grown over the years—the full name is Bob Hamilton Plumbing, Heating, A/C & Rooter—so has the top line for this Lenexa company, a residential home-services specialist in plumbing, heating and air conditioning systems and sewer-line rooter services. New and better technologies and an experienced work force are cited as growth factors. Spanning three generations and more than 5,000 homes it has built in the region, Prieb Homes continues to thrive, most recently by expanding into land development and boosting market share by expanding into new communities. The company is now under the direction of Greg Prieb. Founder Pasquale Trozzolo passed the leadership baton to son Angelo at the start of 2014, and Trozzolo Communications Group hasn’t missed a beat, blending strategic acquisition with organic growth to double in size since 2012. Top talent, says Angelo, continues to move the needle for a growing group of clients with their skills in advertising, branding, public relations and digital marketing. This advertising and digital marketing agency has clients in such varied sectors as health care, technology, financial services, engineering, food and agriculture. A full-service, strategic marketing firm, it provides strategic planning, research, branding and design services, interactive development, as well as advertising across every platform—digital, broadcast, cable, radio and print. ProPharma Group provides comprehensive compliance solutions to the global pharmaceutical, biotechnology and medical device industries. Among those are compliance, quality assurance, program/project management, validation, medical information and pharmacovigilance. Loyal clients and repeat business are key drivers of organic growth in recent years. With a rapid growth in employees, DEG has been recognized by Inc. magazine as one of 25 Companies Changing the World. It does that with social radar and social-media content generation services, e-mail marketing acumen and e-commerce develop-ment, mobile and paid media, and other tools to get people talking about brands and to help companies act on consumer sentiments. By serving two large and divergent sectors—hospitality and health care—and by offering both off-the-shelf and custom services, Regal Distributing is able to drive sales of its food-service packaging products, such as carry out containers, deli trays, cutlery, napkins, cups, straws and lids. It also offers those outlets and institutions products for building maintenance and LED lighting. Casey Lund is the first business owner we’ve ever heard apply the Japanese version of corporate cultural improvement—Kaizen—to a vehicle-repair operation. But continuous improvement drawing on lean manufacturing principles has helped develop employees to provider better, more efficient service, a key growth driver, he said. This digital marketing agency specializes in new-customer acquisition for national and regional brands in varied sectors like home services, retail, financial services, and e-commerce. The differentiator for this firm is its ability to track and manage marketing efforts at the local level. It provides site development, SEO, paid search services, social media content and social radar. Ethan Whitehill launched his own agency in 1997, just the Internet started to disrupt the advertising world. In the nearly 20 years since, Two West has mastered the Web side of the brand-development experience. It has amassed an impressive client roster of local giants like Sprint, AMC Theaters and H&R Block, as well as national brands like Disney and MillerCoors. This Lenexa-based firm offers comprehensive financial planning and wealth management guidance for individuals and households. CEO Jim Guyot attributes its growth to exceptional service, which in turn has brought in more assets from existing clients. Then, too, the addition of another wealth manager has paid growth dividends. This 46-year-old architecture and design firm has worked on projects all over the nation, and on some of the most iconic imagery in the Kansas City region. From commonplace projects like schools right up to this area’s civic jewels, BNIM’s work has crafted a reputation for design that blends form with function, earning national design awards for its sustainability initiatives. Just 43 strong in employees, TK Architects International really is global, providing concept, interior design, architectural and engineering services in-house, with a primary focus on design of cinemas and entertainment facilities. The public gathering spaces it designs include movie theaters, bowling alleys, bars, restaurants, cafes and other venues. This Lee’s Summit agency packs a lot of service lines into its tool kit. Advertising services include branding and marketing collateral, with all the elements needed to make visuals sing: video, photography, illustration and design. But it also offers digital and franchise marketing services (including social media content, SEO and various paid-search tools) and white-label collaborations. It started in 1997 with five KFC stores in Colorado. Today, KBP Foods operates 361 restaurants in 13 states from the Great Lakes to the Atlantic and the Gulf coast. That has earned it the distinction of being both one of our 100 fastest-growing companies and one of the region’s 100 biggest private companies. Advanced organizational age and rapid growth don’t often go hand-in-hand, but that dynamic holds at Community First—founded in 1901 and now the oldest bank in Kansas City, Kan. With a full line of personal and commercial banking services, the bank operates in three locations— in Downtown KCK, in the Village West area, and in nearby Shawnee. MMI is a full-service incentive and promotional products company that generates merchandise to help corporate clients incentivize their employees, build loyalty and increase sales with their own customers or clients, and advertise their brands. It also offers Web-site creation and maintenance, warehousing and order fulfillment, kitting services, and innovative branding. Hard to believe one man started this company as a commercial janitorial service 56 years ago. Today, Frank Oddo’s son, Jeff, is at the helm of a national growth beast. City Wide’s franchising model has taken the company’s range of services—for both interior cleaning and upkeep as well as exterior maintenance—and continues to drive strong growth for the Lenexa-based company. This Olathe-based commercial contractor has found success by developing expertise in a range of construction formats—it builds schools, government buildings, hotels, multi-family apartments, public-safety facilities, retail operations, sports venues and parking garages. Its construction services include preconstruction, construction management and design-build. More engineering, design, construction and consulting services, offered in more locations in the U.S. and around the world, and more employees to deliver them. That’s been the formula for rapid growth at a company nearly 120 years old, pushing Burns & McDonnell past the 5,000 employee mark and near the $2.7 billion revenue mark. Year-in, year-out, the Jeffs at ProForma Promotionally Yours—Jeff Levy and Jeff Bowers—lead this Kansas City, Kan.-based mighty mite with the smallest staff, but big numbers. 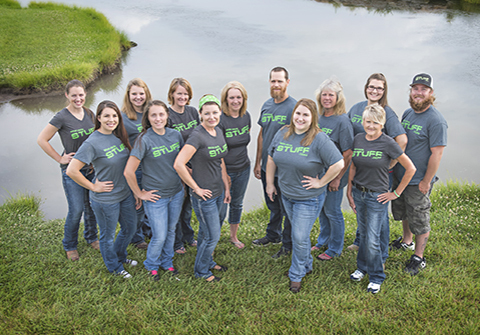 Still with just three full-time employees, the company cranks out promotional products, marketing support and brand-management solutions for corporate clients. Staffing agencies began to feel the pinch as the nation’s unemployment rate began to edge back down in 2012, but during that same time, American Consultants has ridden a formula of health-care staffing to a repeat CR 100 performance. It finds talent for health-care providers at all levels—executive, clinical, laboratory, financial, consulting, and information technology. One of the nation’s biggest providers of delivery services for used semi trucks and specialty vehicles, Team Drive-Away operates across the U.S. and Canada. The recipe for its most recent success includes a heaping helping of added capacity for its driver network; company officials say that has allowed Drive-Away to grow its customer base. High-growth performance at Midway is like a Ford truck engine: It just keeps humming along, and the Northland seller of new and used fleet and commercial trucks, vans and SUVs has it in high gear for yet another year. The company also offers truck uplifts in various configurations, as well as parts and service and vehicle financing. After changing its name in 2010, expanding from its base in a town of 1,650 people and into the Crossroads district, and setting its sights on entrepreneurs and early-stage business clients, the former Garden City Bank is doing what the name implies: leading. Those moves have generated an asset base that’s up more than 60 percent since the rebranding as Lead Bank. PB&J Restaurants has dining venues in Denver, St. Louis, Little Rock, and Wichita, in addition to those here at the home base in Kansas City. It also provides institutional-level offerings that crank out hundreds of meals a day for companies like J.E. Dunn and Deluxe Checks Corp., as well as organizations like Bishop Spencer Place, and it offers catering services and gift cards. Gould Evans is an award-winning design and planning firm with a diverse-by-design portfolio that encompasses higher-education projects, cultural institutions, athletic facilities, civic buildings, wineries, living spaces, research facilities and workplaces. But it also is committed to environmental branding and urban planning. Fran Henderson founded this Lenexa company in 1970, and for nearly two decades, was its only professional engineer. Sons Doug and Duane came on board in the ’80s, and before long, it was a different company. Today, it has more than 600 employees working at 12 locations nationwide, offering engineering for mechanical, electrical, plumbing and refrigeration needs. ARJ Infusion Services is a national specialty pharmacy and high-tech nursing services organization that provides home-infusion therapies for children and adults with acute, rare, and chronic conditions. Since 2013, its growth strategy has been focused on increasing overall market value and revenue, and offering core therapy services in each of the 50 states. This Overland Park company offers parcel auditing and intelligence technology that produces a no-risk/high-reward for companies seeking to recover costs from unfulfilled parcel deliveries—and by helping them find solutions to prevent recurrences. Since 2012, it has more than tripled its employee base, improved its audit technology, and launched two additional products. The king of the CR 100 is now Kansas City’s biggest private-sector employer, and it’s going to get a lot bigger. After storming past the 11,500-employee level in 2015, the health-care software and informatics giant has its sights set on 25,000 workers when the Three Trials Campus, the largest development project in the history of the state, is completed in south Kansas City. Dimensional Innovations is all about what it calls “good, old-fashioned American craftsmanship.” That means teaming graphic designers and architects with brand strategists and filmmakers, designers from various disciplines (interior, interactive and environmental) digital engineers and others, and turning them loose in a 70,000 square-foot state-of-the-art workshop. Based in south Kansas City, BalancePoint provides IT project solutions, IT staffing services, leadership, and strategic guidance. A fast-growth firm for nearly a decade, the company says its success stems from having created a culture and environment where people want to work, which attracts top talent.